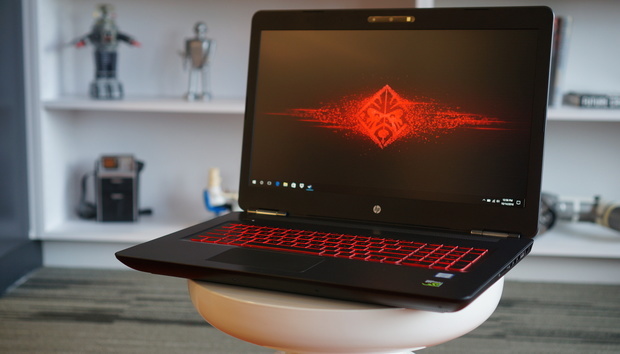 You can think of HP’s updated Omen 17 as that sleeper car that pulls up next to your tricked-out ride at a stoplight. When the light turns green and you lay rubber, expecting to leave that tan sedan breathing your exhaust, you’re instead shocked to see it hanging right next to you. That’s the HP Omen 17 in a nutshell. Sure, it carries the famous Omen brand and a couple of cues that it’s a gaming laptop, but next to just about all the other flashy gaming laptops, it’s downright bland. The good news for HP is that the flashing lights and oversize faux exhaust vents aren’t what make a gaming laptop go—it’s the parts inside. This is where HP makes huge strides. The last generation of Omen gaming laptops topped out with Nvidia’s GeForce GTX 965m GPU, which, when coupled with the laptops’ 4K screens, made no sense. The new Omen 17 turns the GPU dial up all the way up to a GeForce GTX 1070 GPU. In Nvidia’s pecking order of laptop graphics chips, only the GeForce GTX 1080 is faster. The Omen 17 we reviewed was paired with an Intel quad-core Core i7-6700HQ CPU, a 4K G-Sync panel, 16GB of DDR4/2133 RAM, a 256GB M.2 NVMe drive, and a 1TB hard drive for bulk storage. Those looking for an optical drive will be disappointed, but our unit did come with a USB optical drive in the box. HP said it jettisoned the optical drive to make more room for the hardware and the coolers to keep it running. High performance gaming laptops today all seem to feature aggressive exhaust vents The Omen 17 on top? Not gonna play that game. OK, so you know you don’t get the fancy programmable macro keys and multi-color keyboard, but HP gives you one thing the others overlooked: An Intel Real-Sense camera. Paired with Windows 10’s Hello function, you’ll quickly forget you even have a password on the Omen 17. As an infrared camera capable of sensing depth, the Real Sense camera can also be used to create a faux “green screen” and can automatically clip out the background when you’re cutting your latest Twitch video. The other plus with the Omen 17 is its size and weight. At seven pounds, three ounces without its brick, the Omen 17 is almost two pounds lighter than the other 17-inch laptops we’ve seen. It’s also quite a bit thinner, at just over 32mm. The Asus G752VS OC Edition, by contrast, pushes 50mm. It’s red, but there’s no support for any other color nor zone lighting on the Omen 17. In the port count, the Omen 17 gives you a reasonable but not overly generous selection. With a total of three USB Type A ports, HDMI and miniDisplayPort, mic, headset SD card reader and Gigabit ethernet, you’ll mostly be happy. Notably missing from the Omen 17 is Thunderbolt 3, which is rare not to find in a high-end gaming laptop. Thunderbolt 3’s use on a high-performance laptop would be to transfer files at 40Gbps. If there’s no Thunderbolt 3, HP could at least have integrated a USB 3.1 10Gbps controller to let you move files faster than the Omen’s 5Gbps ports. One other meh feature of the Omen 17 is the audio. The laptop has Bang & Olufsen tuning, but I found the audio lacking when compared to other 17-inch laptops. It just can’t bring the beat. It wouldn’t have been as bad for a mainstream laptop, but I expect more from big gaming laptops. You get a Gigabit ethernet, HDMI 2.0, two 5Gbps USB Type A ports, a miniDisplayPort and SD card reader on the right side of the Omen 17. The left side adds one more USB Type A and two analog audio ports. The most important matter in a gaming laptop is how well it performs in games. The Omen 17 doesn’t disappoint there. To see just where the Omen 17 and its GTX 1070 falls in the pecking order, I compared it to a spate of old and new burly gaming laptops. To get a feel for how much performance is available from each level of GPU, I threw in the tiny Razer Blade 2016 and MSI’s new GS63VR Stealth, the latter of which I’m currently reviewing. The test is 3DMark FireStrike Extreme, and I’m reporting only the graphics sub-score, which isolates the GPU performance a little more. For the most part, the Omen 17 hangs slightly behind the Asus Republic of Gamers G752VS OC Edition that we reviewed. That’s no surprise, as the Asus has the same GeForce GTX 1070 GPU. The Omen 17 and its GTX 1070 flatly leave the older GTX 980m and even the GTX 980 sucking exhaust. The Omen 17 is a slightly slower than the Asus G752VS OC edition in 3DMark FireStrike Extreme Graphics. The test above is 3DMark FireStrike Extreme. I’m reporting only the graphics subscore, which isolates the GPU performance a little more. Because many people have access only to the 3DMark FireStrike Extreme Overall score, I’ll also provide that data. Even though it factors in the CPU a little, it’s still mostly a graphics score and doesn’t change much. 3Dmark FireStrike Extreme’s overall score counts the CPU and GPU performance but it’s still mostly a graphics tests. Even though 3DMark is a very reliable test, it’s still synthetic. People want to see performance based on actual game play. I ran the numbers in Tomb Raider set to Ultimate quality level and 1920x1080 resolution. The results mostly mirror the 3DMark scores: GTX 1080 is on top by a comfortable margin, followed by GTX 1070, GTX 980, GTX 1060 and then GTX 980m and GTX 970m. The performance you get from the GTX 1070 in the Omen 17 is just plain impressive. Tomb Raider is an elderly game at this point, so I also crunched the numbers in the fairly new Rise of the Tomb Raider. At 1920x1080, the Omen 17 is pushing nearly 95 fps, far more than you need. The bad news? It’s about 10 percent slower than the Asus G752VS OC Edition, which I’d attribute to the higher clock speeds of the GPU in that model. I didn’t happen to have scores for the GTX 980m and GTX 970m available in this test, but you can assume both of them would be slower. Rise of the Tomb Raider is newer than Tomb Raider and you see you need a bigger GPU to run it. As the Omen 17 has a 4K display I also wanted to see how it would game at its native resolution. For that I fired up Middle-earth: Shadow of Mordor with the 4K textures installed. The performance, again, just trails the Asus G752VS OC Edition a tad. It’s not huge, but it’s still roughly 5 percent slower. I also ran Rise of the Tomb Raider at 4K set to Very High. The result drags the laptops down even further. In fact, I’d recommend trimming some game settings if you really want to play on the Omen 17. At this resolution, you really need at least a GTX 1080 to hit the magical 60 fps. The good news for the Omen 17 is that 4K panel supports G-Sync, which smooths out low frame rates exceptionally well. It’s enough that playing games in the 40 fps range isn’t as atrocious as you might imagine. Rise of the Tomb Raider should probably be run with a few settings trimmed down at 4K resolution on all but the GTX 1080. I don’t believe in the 100-percent gamer, because everyone does something besides gaming on a PC once in a while, right? That means the CPU still matters. To test the CPU performance of the Omen 17, I ran our Handbrake 0.9.9 and encoded a 30GB 1080p video file using the built-in Android tablet preset. Because every laptop here save the Origin EON17-X (review forthcoming) used Intel mobile Skylake quad-core CPUs, the performance was pretty much a tie when the Predator 17X and Asus G752VS OC Edition were run at their out-of-the-box stock speeds. Overclocking would lower their scores, but none of them would likely touch the Origin EON17-X, which has a desktop Skylake quad-core CPU in it. Our Handbrake tests puts the quad-core mobile CPUs all in a similar performance range. Small laptops might as well be iPads for all the upgrades you can perform. Big gaming laptops usually offer some ability to service the interior, but the Omen 17 is an exception, unless you love removing a lot more screws. There is a single door on the bottom, but removing it gives you the ability to upgrade the RAM, and that’s it. Hint, HP: people like to upgrade the storage subsystems and maybe clean the fans out on occasion, so make the access door bigger. HP gives you fairly limited access to the guts of the Omen 17. Pop the door open and all you can replace is the RAM. Despite the sedate style, the simple truth with the Omen 17 is that you’re getting top-of-the-line performance at a pretty good price. Our review model, for example, with its GTX 1070, quad-core CPU, 16GB of DDR4/2133 RAM, 256GB SSD, and 4K G-sync panel is $1,800. To get those parts in a 17-inch laptop from other vendors might cost you another $200 to $400. Of course, those other vendors will give you a more aggressive look, more flashing lights and more bling, but is it really worth it? That’s ultimately up to you. As it stands, the Omen 17 is hella fast and a hella good deal. The Omen logo is a vestige of Voodoo PC that HP bought in the go-go 2000’s. « Are you ready for remote project management?